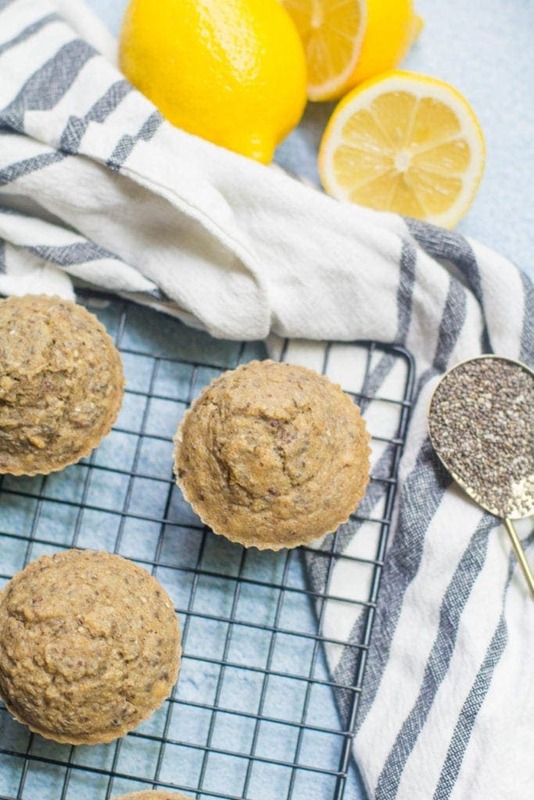 These Healthy Lemon Chia Seed Muffins are basically like a ray of sunshine in muffin form. I swear I could eat them for breakfast every day! They’ve got the perfect amount of zesty lemon, protein and omega 3’s from the chia seeds, and just taste SO yummy! I came up with this recipe years ago when we first moved into our apartment, and it’s been one of my favorites ever since. This week, I’ve teamed up with tons of different bloggers for Muffin Week 2018! You’ll find all kinds of muffins (sweet + savory!) from lots of other talented food bloggers here like these Healthy Lemon Blueberry Muffins or No Sugar Added Pumpkin Zucchini Muffins… yum! On the first night we were in our new apartment together (and ate popcorn for dinner on top of a moving box) I promised Tyler I would make him whatever he wanted for breakfast to make up for our lack of exciting dinner. I didn’t want to crush his hopes and deny the request, so I just agreed and figured I’d come up with something in the morning. 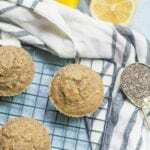 When I was getting out the ingredients to bake the muffins, I noticed I had a big bag of chia seeds in our pantry that would be PERFECT as a replacement for the poppy seeds. I’m kinda in love with chia seeds. Even though they’re little – they’re tiny powerhouses! Just one tablespoon of them has 4g of fiber, 3g of protein and more than a third of your daily recommended intake of omega 3 fatty acids! 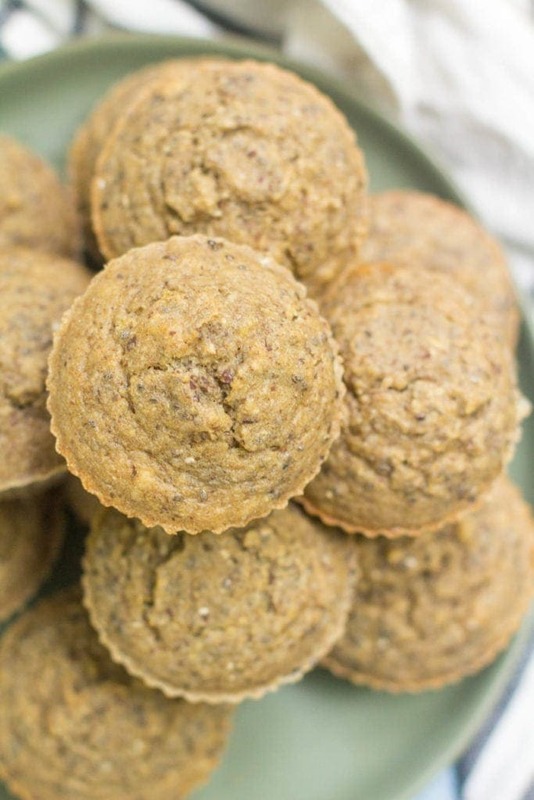 Healthy whole grains – The base of these muffins is a combo of oat and whole wheat flour! Usually muffins are made with white flour, but the whole grains help make this a healthier muffin that will keep you fuller for longer! Back to the muffins… So I subbed in chia seeds for the usual poppy seeds…. and Tyler gave them the stamp of approval. I think you’ll love them just as much! They’re a little tangy from the lemon, perfectly sweet from honey, and have a little superfood crunch thanks to the chia seeds. You’re gonna love them! If you don’t have flax seed meal, you can pulse flax seeds in a food processor or blender until they are fine. Love muffins? Try these healthy muffin recipes! 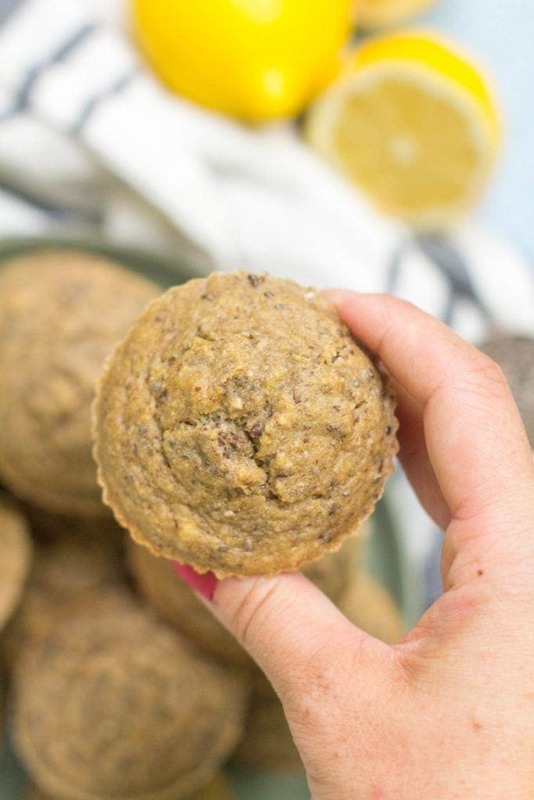 These Healthy Lemon Chia Seed Muffins are the perfect breakfast! 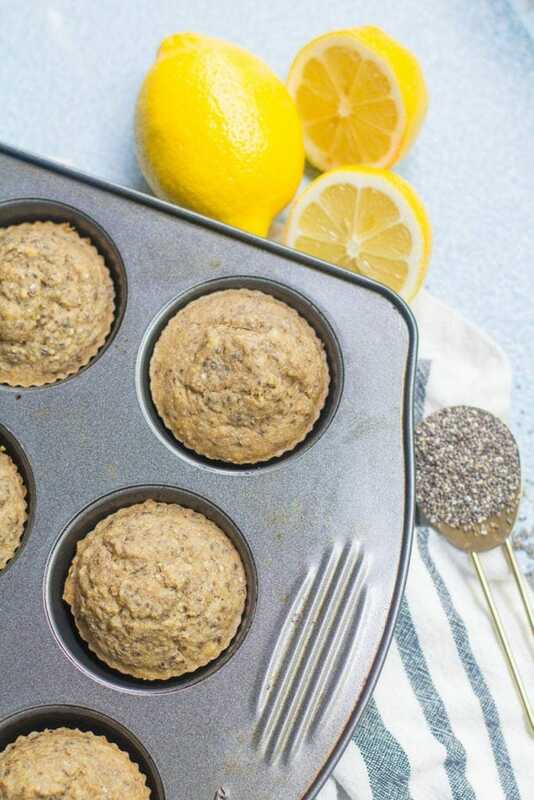 Low in sugar and vegan, they're packed with zesty lemon flavor and nutritious chia seeds. Preheat oven to 350 and prepare a greased or lined muffin tin. In a small bowl, mix together flax seed meal and warm water until combined. Allow them to sit for 5 minutes and solidify to make 'flax eggs'. Stir in flours, baking powder, baking soda, cinnamon + chia seeds. Bake for 20 minutes until edges are golden brown and toothpick comes out clean when inserted inside. If you don't have flax seed meal, you can pulse flax seeds in a food processor or blender until they are fine. They look so perfectly peaked and really yummy; I love the fresh taste of lemons and poppy seeds in muffins. It’s baking soda! My secret weapon 🙂 Lemons in any baked good are great! 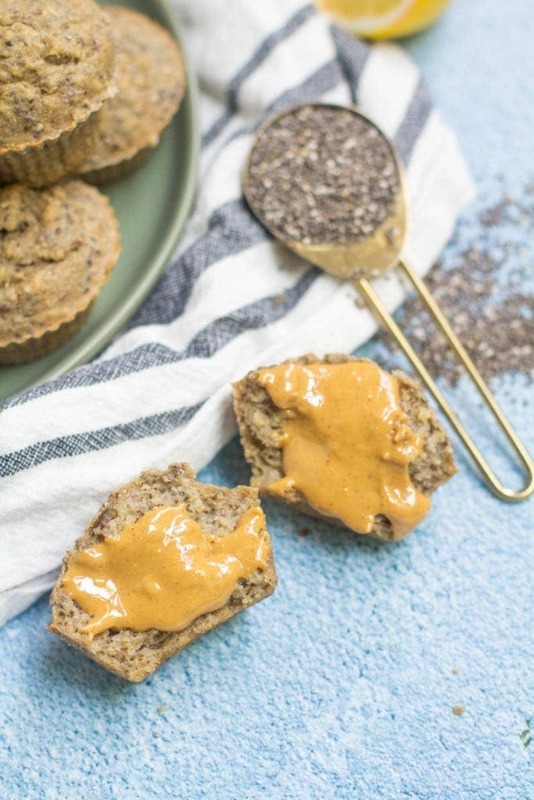 I have a ton of chia seeds I need to find more ways to use, so I can’t wait to try this! Love a healthy muffin recipe. Thanks girl! I can’t wait to try the pumpkin zucchini muffins you posted about!! Love love love these! My family devours them whenever I make them! Really surprised at how fuffy they came out. SUPER simple to make — had all of the ingredients in my apt without having to search for anything crazy. Added collagen peptides to make them even extra special.